Larvae mine foliage from the tip to the base of the branchlet. 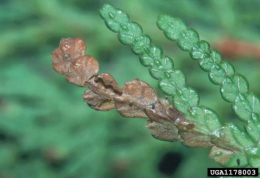 Damaged foliage turns brown and is hollowed out as the larvae feeds from the inside. Tiny emergence holes can be found near the base of brown tissue after adults emerge in spring. 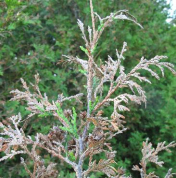 Damage is often confused with winter burn or physiological dieback. Adults appear late June to early July to mate. Adults are small, silver moths with brown fringed tips on the forewing. Eggs are laid at the tips of new branches. Larvae hatch and begin mining into the foliage. Larvae are small (8mm), brown with black head capsules. Larvae feed for a short period and then overwinter inside the leaf tissue. Larvae resume feeding in the spring and pupate in May and June. Pupae of A. thuiella are green with curved tips and can be found within the leaf mine. While A. aureoargentella, and A. canadensis pupate on the surface of foliage in white or brown-flecked cocoons respectively. There is one generation per year. Manual Prune tips before June to provide some suppression. Chemical To manage larvae apply approved insecticides either as a soil drench or as a foliar application in the early May or late August. 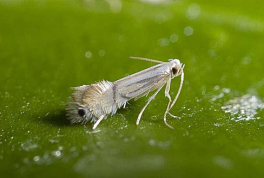 Perform a foliar application to suppress adult moths in June.